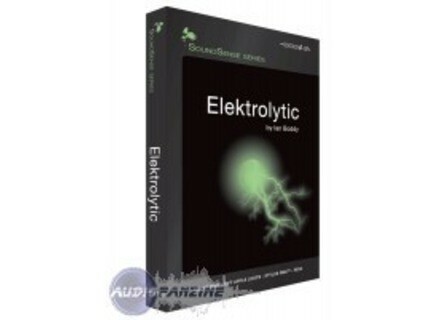 SoundSense Elektrolytic, Big Beat / Industrial Sample from Zero-G.
Elektroytic is the second sample library by Ian Boddy in the Zero-G SoundSense series. The programmer of many sample libraries including Ambient I & II, Malice in Wonderland, Morphology and Outer Limits Boddy is well known for his imaginative and unusual sound design skills. There are 250 "drum" loops at 100, 120 & 140 BPM categorised into 4 sections ( Drum, FX, Lo-Fi/Glitch & Percussion ) as well as 250 hits & one-shot samples categorised into 3 sections ( Ambient One Shots, FX Hits & Percussives ). Furthermore all the 250 loops are provided in Rex2 format for maximum programming flexibilty in your own compositions. The sounds themselves have been treated and mangled with a huge array of effects and editing techniques. These include beat synced filtering, phasing & flanging as well as lo-fi treatments such as extreme distortion and bit crushing. Further exotic manglings are provided using things such as spectral analysis, granular resynthesis & textural morphing. Sonivox adds 16 new titles Sonivox adds 16 new titles to their 'LoopLine' range. Heavyocity Evolve Heavyocity Media has announced the release of Evolve, a new virtual instrument geared toward film and game audio, as well as artist production and live performance.